There is no way around it. Managing your life with cancer has a great number of challenges. Some you can control or manage but others you cannot. For many individuals, the worst thing about chemotherapy is the thought of losing their hair. Understanding the process and being prepared for hair loss is half the battle. Chemotherapy affects everyone differently. Some people will lose their hair completely while others may only experience thinning. Some patients may not see any affects at all. It is helpful to prepare yourself as you discover how chemotherapy may affect you. Begin by talking to your doctor or nurse. They will know the likelihood of hair loss based on the type of chemo drugs prescribed. Different classes of chemotherapy drugs typically lead to varying degrees of hair loss. Chemotherapy drugs are designed to slow down the rapid cell growth of cancer cells by attacking the cells' DNA to prohibit growth. Because chemo drugs are designed to kill rapidly dividing cells, other rapidly growing cells in the body (such as the cells that cause hair growth) are also affected. Not all chemotherapy will cause hair loss, but certain drugs will cause loss in varying degrees. For example, Methotrexate is known to cause thinning of hair in some patients, but it is rare for anyone on this type of drug to experience complete hair loss. Adiamycin and Taxol can both cause complete hair loss on the head, as well as the body and face, while Cytoxan and 5-fluorouracil can cause varying degrees of hair loss from minimal to significant. One encouraging thing to remember is that your hair loss means that your chemo treatments are working. For more information on why chemo causes hair loss, visit this blog post. 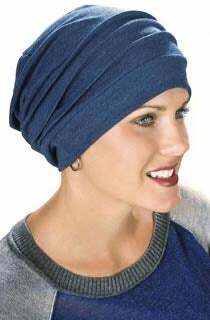 As soon as you learn that your chemo treatments will result in hair loss, begin shopping for wigs, headcoverings and scarves while you still have hair. Give yourself plenty of time to shop. Being prepared will relieve much of the anxiety and stress that comes with losing your hair. The experience of hair loss will vary from person to person. Once treatments begin, some people notice their hair gradually thinning out. Others find that their hair falls out in clumps when they brush it, or just throughout the day in the bathtub or on a pillow. Some patients will experience baldness only on the head, while others will lose facial hair, eyebrows, eyelashes and other body hair. Most chemo patients report losing their hair approximately 2-4 weeks after starting treatments. Just before hair loss begins, some people report the feeling of "itching," or "tickling" on the scalp. Because chemo causes your hair follicles to become inflamed, those with very sensitive scalps may experience "scalp pain." In fact, it's the inflamation of your hair follicles that causes the hair to fall out. Shaving your head can relieve these sensations if they are bothersome. They will also go away as soon as your hair falls out naturally. You may feel more in control of your hair loss by cutting your hair very short to gradually ease into hair loss. You may wish to shave it off altogether. This often eliminates the trauma of your hair falling out over a period of days and makes it easier to manage. If you do retain a small amount of hair, a shorter hairstyle will make any remaining hair look thicker and fuller. If you decide to shave your head, use an electric shaver instead of a razor to avoid cutting yourself. Most chemotherapy patients find that they gain peace of mind by being prepared and proactively shopping for headwear and wigs before hair loss happens. Others decide to forgo wigs altogether and go bald. No matter what you decide, having something warm for your head in the evenings or out and about on cold days is a must. Also, considering sun protection is essential. The hair loss process is as unique as you are, so go with what feels right for you. During chemotherapy treatments, it is important to treat your hair and scalp with care. If you are fortunate enough to keep your hair during chemo treatments, it can often become brittle, thin and damaged. Your scalp may also become dry, itchy and flaky. Protect your hair by avoiding any unnecessary stress. Use a mild conditioning shampoo, such as Alra Shampoo, and use warm but not hot water when washing your hair. Pat your hair dry with a soft towel instead of wringing or twisting it. Avoid chemical treatments, colors, bleaches, perms, hair dryers and heated styling tools. If you do lose your hair, your scalp can become tender. It is important to continue cleansing your scalp using a mild conditioning shampoo even once the hair has fallen out. Without your hair, your scalp will be much more sensitive to sunburn. To prevent sunburns on the scalp, always apply a high SPF sunscreen before sun exposure. Chemotherapy treatments can also make the skin more sensitive to sunlight so it is especially important to use sunscreen wherever any of your skin is exposed to sunlight. In addition to wearing sunscreen, some of our hats feature SPF built right into the fabric to help protect your scalp from the sun's harmful rays. This can provide an extra layer of protection, while also keeping the sun out of the eyes and off of the face. Many women find that they prefer to wear headwear instead of wigs. We offer many options to meet each individual's unique personality. When you select a hat, choose one that is comfortable. Our hats are specially designed for a comfortable and secure fit. They will provide a flattering look and full head coverage to a bald head. Because they are fashionable, they will be indistinguishable in appearance from the hats you will see in your favorite fashion magazine. But they will be comfortable, they will fit, and they will conceal your hair loss seamlessly. Brimmed, structured, soft, textured, fancy, casual, or anything in between...with so many hats to choose from, your options are unlimited! These versatile head coverings can be worn in many ways and are made from many different fabric types. 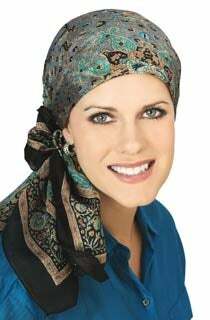 Some cancer patients do not want (or are unable to) tie a scarf, so we offer both untied and pre-tied head scarf options. A scarf is an elegant option for women who want to experiment with sophisticated, feminine looks in various patterns and colors. These caps have become a “go to” cancer hat for many women with hair loss. Turbans are typically made from soft material and constructed to look like fabric wrapped around the head. These are the perfect choice for every day wear and can be dressed up or down with accessories depending on the occasion. Turbans are also a great choice because they can double as sleep caps. It is important to maintain your body heat during hair loss because 30-50% of a person's body heat is lost through the head. Our sleep caps are a very useful way to maintain your body heat at night and are a comfortable, practical option during hospital stays. Our company began because our founder could not find an attractive sleep cap to wear during her cancer treatments. When she came out of surgery for breast cancer, the doctors had left the surgical cap on her head because she was bald. She was mortified, and vowed to create a pretty sleep cap so that others would not have to endure the shame she felt. 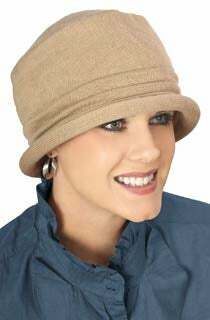 See our Cancer Hats Buying Guide for more detailed information about selecting a cancer hat, including an explanation of fabric types, what to look for in a cancer hat, accessory ideas, and care instructions. Wigs allow you to maintain the appearance of having hair throughout treatments. Fashioned in almost any style and color you can imagine, it's possible to find both a style and color that look very much like your own hair. Unlike the wigs of yesteryear, today's wigs are comfortable and extremely natural looking. We recommend shopping for your wig as soon as you know that you will lose your hair. Shopping for your wig while you still have hair will not only make the transition easier; it will allow you to easily match your wig to your current hair color and style. Many cancer patients come to us looking for a human hair wig. Although we carry human hair wigs, we encourage our chemotherapy patients to select a synthetic wig instead. Our high quality synthetic wigs will be indistinguishable in appearance from a human hair wig, but they are much more affordable and easier to take care of. If you choose a high quality wig, no one will be able to tell that it's not your real hair. When you select a wig, you will most likely want to choose one that matches your own hair color. If you save a hair swatch and mail it to us, our certified wig specialist will help you select the closest possible color match to your own hair. You can personalize your wig by having your hair stylist cut and style it. This will ensure that your hairpiece is cut to frame your face and that it is styled in the most flattering manner for your particular face shape. For best results, you should be wearing your wig while it is being cut. A wig is going to feel different at first. Give yourself time to adjust to the new sensation. Wig caps, comfort gel headbands, or wig grippers an be worn under a wig to add additional comfort. To help get you started, see our Wig Buying Guide for step-by-step instructions on how to select the perfect wig for you! Every person reacts differently to treatments. Hair loss may be limited to your scalp area, or you may lose the hair on your entire body, including your eyebrows and eyelashes. Many cancer patients find this intimidating, but we offer several easy options for re-creating a realistic eyebrow including temporary eyebrow tattoos, eyebrow makeup and realistic human hair eyebrows that are easily applied to the skin. Our false eyelashes are specially designed to create a natural look for chemo patients. They are easy to apply with a little practice. Please see our Eyebrow Guide and our Eyelash Guide for more detailed information about selecting the best options for you. While hair loss is not a specifically medically serious condition, it can have a significant psychological impact on an individual. Some people experience a wide range of emotions during and following hair loss. When you are going through hair loss and chemotherapy treatments, it is important to talk about your feelings. Feeling angry and sad is a normal part of hair loss. Most cancer patients will go through the 5 stages of the grieving process as they begin to cope with their diagnosis. The stages of grief are: Denial, Anger, Bargaining, Depression, and Acceptance. Every person grieves differently. Be aware of your feelings and recognize that they are normal and expected. It is especially important to build your support network and lean on others for support. Cancer support groups bring great comfort to many patients. It helps tremendously to share your experience with others who are also going through the same experience. You will gain insight and inspiration from those who are completing their journey. For more information on finding a support group, see our blog post on Cancer Support Groups. Talk to your health care professional, minister or someone you trust and remember to turn to your support network as you face this challenge. The good news is that your hair should grow back following treatments. It is not uncommon for it to grow back with a different color or texture, although some find that it comes back in the same as it was before treatments. If your hair grows back in with a different color or texture, these changes are usually temporary. Many individuals find that their hair will return to its original color and texture over several months. Hair regrowth is unique to every individual. Hair may take several weeks after finishing treatment to begin regrowth. You will want to continue using gentle shampoo once your hair does start to grow back, as it may be brittle and dry. Continuing to care for your scalp in this manner will keep it nourished and encourage continued growth as your hair comes back in. Avoid harsh or strenuous brushing and high heat. Use a soft massaging brush and gentle settings when using hair dryers. Most of our customers like their headcovers so much that they continue to wear them even after their chemo treatments are over and their hair has grown back! Donating your headwear to a local treatment center or cancer support group is also a great way to give back to the cancer community and help others dealing with hair loss once your hair loss journey is complete. Why Does Cancer Cause Hair Loss? © 2000-2018, Headcovers Unlimited, Inc., All Rights Reserved.